Batman-actor Christian Bale had to become "a beast" in order to sell the role to himself. While Christopher Nolan's Batman films are, for the most part, held in high regard there are elements here and there that were perhaps less than well received. Chief among these came from the Caped Crusader himself, Christian Bale. 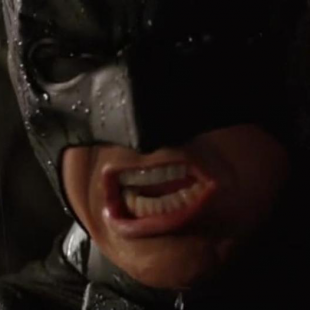 While Bale was well-received overall as the man behind the mask, his gravel-laden take on Batman's voice has been a subject of ridicule pretty much since its introduction. Speaking about his Bat-voice recently Bale revealed that he did the voice at his initial audition and was certain then that it had cost him the part. "I went home that evening, and my wife said, 'How'd it go?' I went, 'I kind of did this.' And I showed her, and she went, 'Oh, you f***ed that one up, didn't you?'" That being the case, there was a rationale behind his decision to make Batman sound the way he did. "I got there. They put me in Val Kilmer's suit. It didn't even fit properly, and I stood in it and I went 'I feel like an idiot.' What kind of guy walks around, dressed like a bat? And is then going to go 'Hello, how are you? Just ignore that I'm dressed as a bat,'" explained Bale. "I went 'I can't do this in a normal voice. I have to become a beast in order to sell this to myself.'" Bale would, of course, sell it to the filmmakers too and then opted to continue with his Bat-voice after taking on the role proper. "[The voice] ain't for everybody," he admitted. "It was the only way that I could find how to get into that and to justify wearing the fricking Batsuit. Otherwise, he's just loopy beyond belief." Loopy or not, we still can't help but wonder if there weren't anything even slightly more subtle that Bale could have done to put himself into the role. For instance, in Batman: The Animated Series voice actor Kevin Conroy used a Bat-voice that was both distinct and fully intelligible. We just like to be able to understand what the actor is saying, is all.